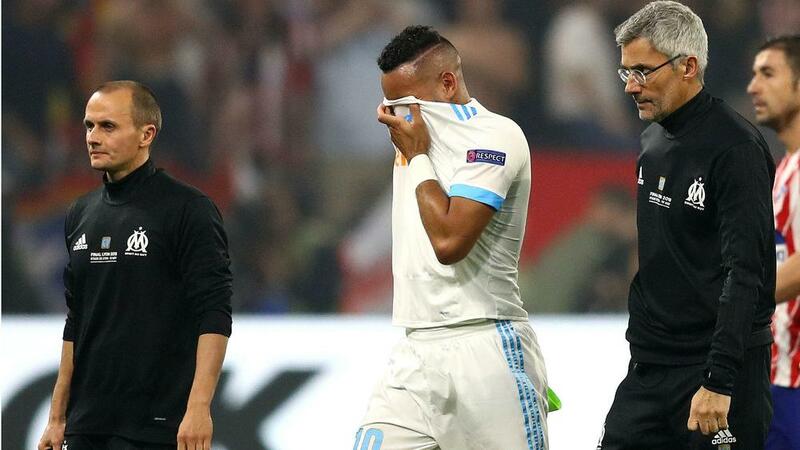 Dimitri Payet left the field in tears after succumbing to injury just half an hour into Marseille's Europa League final clash with Atletico Madrid in Lyon. Marseille had started brightly but found themselves 1-0 down to an Antoine Griezmann strike when Payet pulled up hurt. The captain was included in Rudi Garcia's starting XI after overcoming a muscle problem that had kept him out of Friday's 3-3 Ligue 1 draw with Guingamp. But Payet - who touched the trophy as he walked onto the pitch before kick-off - wore a frustrated expression before being replaced by Maxime Lopez after 32 minutes. The former West Ham midfielder then became visibly upset as he made his way towards the Marseille bench, being consoled by many of his team-mates – as well as opponent Griezmann – while he left the field.